Blake Longworth, NRS Specialty Accounts Manager, is a dedicated whitewater kayaker and rafter who spends as much time as possible on rivers in Idaho and around the country. 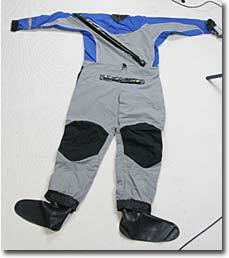 Here, he offers tips on “care and feeding” of drysuit zippers. The zippers that NRS and Kokatat use on our drysuits are super beefy and will withstand lots of abuse. However, if you pinch or crease them in the wrong way you can snap and ruin them. When I go boating (and if it’s just me in the vehicle and I’m not bringing my dog, Buddy), I lay the suit out flat over the rest of my gear. Otherwise, I fold the suit so there’s only one gentle curve in the entry zipper and I’m careful to pack the drysuit on top so no other gear (or Buddy) can compress the suit and damage the zipper. And whereas the debate about whether to store your drysuit with the zippers open or closed will rage on forever, always pack your suit for travel with the zippers closed. The zipper is stronger with the two halves joined together. Step 1: Lay the suit out flat, with the zippers in the closed position. Step 2: Fold the legs up to the shoulder level. The fabric of the suit torso will come up to the bottom of the entry zipper. Step 3: Fold the suit again. There will now be a gentle curve in the entry zipper. Note that a short section of the upper end of the zipper is still exposed. Step 4: Fold the right sleeve over. Here we’re showing the fold with a slight curve in the upper end of the zipper. If you have room in your gear bag, you can fold the arm so that this part of the zipper stays flat. Step 5: Fold the left sleeve over and now you have a compact bundle with the zipper well protected. 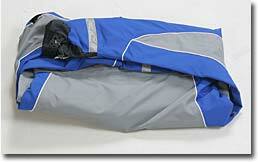 The gentle curves in the zipper and the layers of fabric give good protection. Remember to stow it so that no heavy gear can compress and bend the zipper. 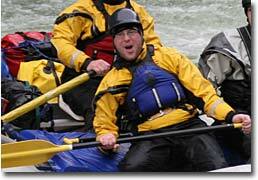 You’ll get along much better with your drysuit zippers if you keep them clean and lubricated. Use McNett Zip Care with its brush tip to clean the zipper teeth, then apply a lubricating coat of McNett Zip Tech for the smoothest operation. Taking these precautions and care steps will keep your drysuit zippers working great for years to come.